Whether they’re spanning surging rivers , impossibly deep chasms, or any other obstacle that prevented those on one side from reaching those on the other, bridges have held my interest for decades. Living in Brooklyn — which takes up a large chunk of western Long Island — bridges were just about the only way out, so I came to not only appreciate them for their architectural grandeur, but also for where they could take me. These are my favorites. 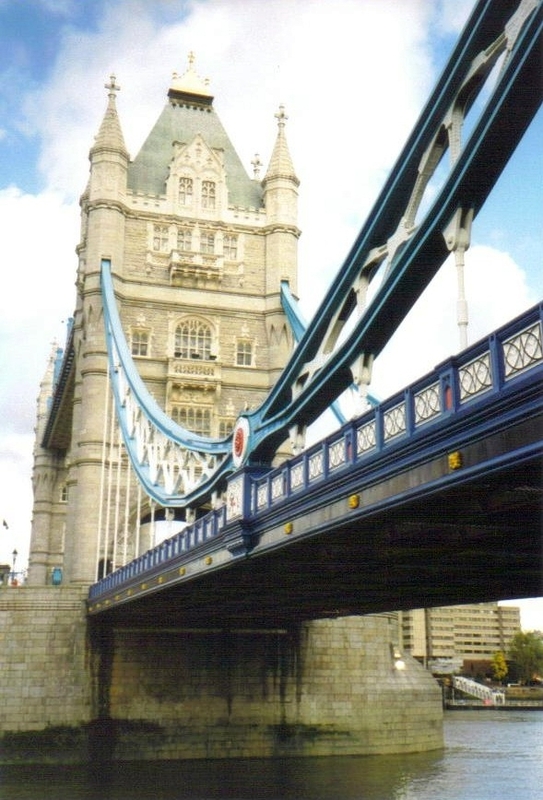 Unlike its neighbor, the utilitarian London Bridge, Tower Bridge is a fairy-tale marvel, a throwback to an era of refinement and grace. Completed in 1894, the Gothic-style architecture belies its Victorian-era construction. With its castle-like towers and high-level walkways, this iconic crossing over the Thames River offers fantastic views of key London landmarks and always garners media attention for such special occasions as New Year’s Eve and the 2012 Summer Olympics. This bridge is always more to me than just a way to hurry from Southwark over to the Tower of London; it’s an excellent reason to stop and admire what was once hailed as “absurd” and what has become the most captivating river crossing I’ve ever seen. As the romantic Danube River wends its way through the Hungarian capital, the Széchenyi Lánchíd (or, as most of the world knows it, the Chain Bridge) takes center stage right in the heart of the city. I love this bridge for so many reasons: the giant stone guardian lions greeting you as you cross the main span, the views of the grand Parliament Building (Hungary’s largest building) along the Pest side of the river and of Buda Castle atop a bluff high above you on the Buda side, the distinctive towers and graceful arches. 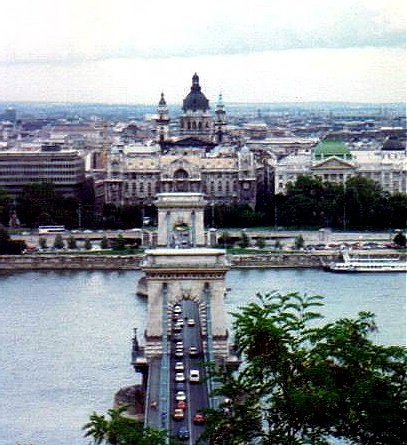 It was the first permanent bridge across the Danube in the city, completed in 1849. Badly damaged by the Nazis in World War II, it was quickly rebuilt and today remains the unmistakable symbol of Budapest. 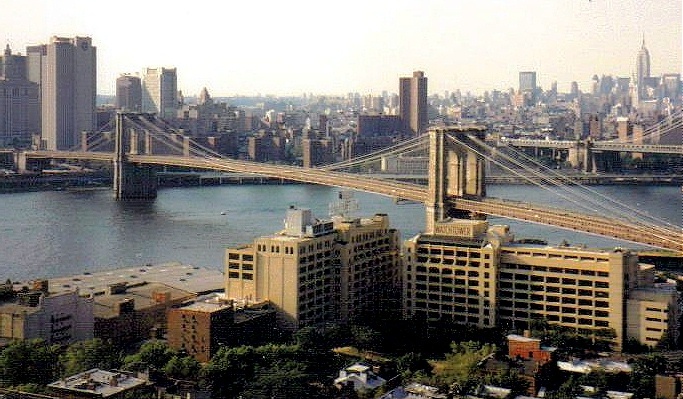 The Brooklyn Bridge was the first bridge I ever crossed, when I was a child in the backseat of the family car as we headed from Brooklyn to Manhattan to visit my grandparents, but sentimentality has little to do with the reasons why this is one of my favorites. Simply put: it’s gorgeous. Ever since it was completed in 1883, it’s been one of the most stunning symbols of New York, and every time I walk or bike over it, I’m reminded why: those two pairs of neo-Gothic arches soaring upwards, the intricate patterns of steel cables, the incomparable views of the Manhattan skyline, the rush of traffic below me navigating one of the world’s most frenzied cities, the lovely chain of lights at night. Throw in its fascinating history — injuries sustained by both the engineer and, later on, the engineer’s son; the parade of elephants over the bridge to prove its stability; the countless movies and wedding proposals made along its span — and this bridge never fails to impress me. Although it’s neither the longest suspension bridge in the world nor the tallest structure in the Western hemisphere anymore, I think it’s still worthy of superlatives. For pure charm and elegance, and some clever planning on the part of the architect, I can’t think of a better bridge than the lovely Triple Bridge over the Ljublanica River in Slovenia’s capital. Situated in what’s now a pedestrian zone, the original bridge, from 1842, could no longer serve the increasing traffic after World War I. 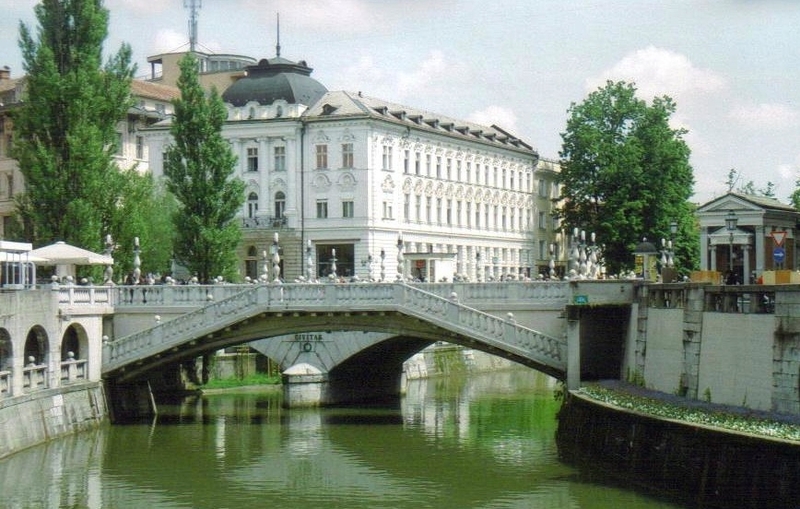 So in 1932, architect Jože Plečnik (Ljubljana’s own Christopher Wren) added a footbridge on either side of the original span. But instead of running them parallel, he attached them at subtle angles, forming a funnel shape. Toss in a couple of staircases that lead down to the lower river terrace and a few hundred balusters, and it’s no wonder that I always slowed my pace on this short bridge to admire both it and the Baroque and Art Nouveau buildings that it gently leads to. This massive bridge made history when it was completed in 1890 after eight years of construction. At almost 8,300 feet, it was the world’s longest single cantilever bridge span — a title it held for nearly 30 years. Today, it’s an enduring symbol of Scotland, named a UNESCO World Heritage Site and depicted on a couple of U.K. bank notes. 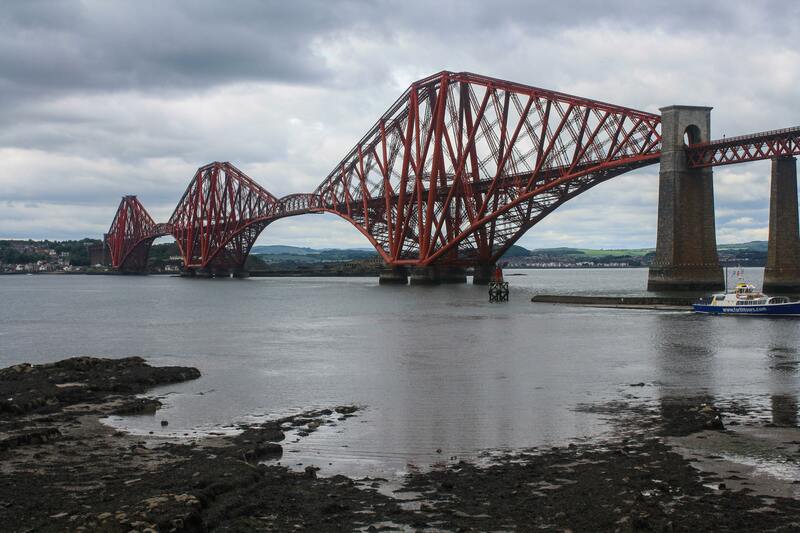 On a bright day, the span shines a bright red, and the masonry towers add elegance to a very sturdy crossing for freight and passenger trains over the Firth of Forth. As I enjoyed my lunch at The Hawes Inn, almost directly underneath the bridge, I felt the rattle of occasional trains passing overhead, secure in the knowledge that the 55,000 tons of steel used in its construction meant this bridge is going to be around for a very long time. Very hard to limit it to five for me. Definitely your top 3. I think the Golden Gate would make it into my final 5 and Sydney Harbour and on or other of the Ponte Rialto or the Ponte Vecchio. I used to work a couple of streets from Tower Bridge and go and eat lunch there in summer. Never got bored of it. Thanks for your comments! The Golden Gate is definitely handsome, and I’m sure if I ever get to Australia, Sydney Harbour would be on the list. But, oh, that Tower Bridge! Unbeatable.